This month, I have been making a big push with my November to Remember, No Excuses November, 30-day challenge 2015 to do a modified version of the Parkinson’s Recipe for Recovery® for 30 days. As we enter the final day, I am happy to have heard that many of you had very positive experiences when seeing family and friends during the Thanksgiving holiday. This is quite wonderful. So, you wonder, what’s next? To read “what’s next,” you will have to come back to this website and blog tomorrow. Do not ask yourself “what’s next?” Ask yourself, “what’s now?” You see, there is still one more day to finish the challenge. You made a commitment to do the scaled-down version of the Recipe for 30 days, and today is day 30. What’s next is some future that does not exist in the present. What’s next is your Adrenaline-mode mind fearfully pulling you away from “what’s now,” in this moment, as if what you are doing now lacks significance. What you need to realize is that what is important in your life and your recovery is “what you are doing NOW!” What you are doing right now is what is real and genuine in your life RIGHT NOW!!! If what you are doing now is the Parkinson’s Recipe for Recovery®, then what you are doing now is curing yourself from Parkinson’s Disease. That’s right. The Recipe is a cure for Parkinson’s. So, if you are doing the Recipe, you are being your own cure for Parkinson’s right now. Good for you! If what you are doing now is still thinking about whether or not to accept the 30-day challenge issued 29 days ago, then what you are doing now is thinking instead of doing. What you are doing now is engaging in the same Adrenaline-mode mind thinking and over-thinking that assisted your Parkinson’s symptoms in coming to the surface as diagnosable symptoms in the first place…ultimately, this leads to you getting worse. Es tröstet mich, zu wissen, ich bin hier nicht allein. It comforts me to know I’m not alone here. I know what you mean, Ralli. It is a comfort, encouraging. And, knowing that Howard is recovered from Parkinson’s is priceless. One day at a time, defeating fear, conquering loneliness, sometimes stumbling but getting up and going forward. You are welcome here, Ralli, and you are not alone. I ordered the booklet a year ago and never got started, not believing these exercises and meditations could work. But your posts are so positive, and I started on Nov. 21. The first two days I did the routine in the morning, but on the 3rd day I tried it at night and found far less “thought blockage.” I also perform the actions while listening to healing music. I have seen subtle changes and am convinced I will cure my PD using your wisdom. Many thanks! I love the way you never miss an opportunity to remind us of important truths – in this case, “What you are doing right now is what is real and genuine in your life RIGHT NOW!! !” One of my favourite books is “The Power of Now” by Eckhart Tolle. Thank you for watching over us and guiding us. Warm good wishes to everyone in the network. Thanks for what is to me, your best post. It is the one that I am reading right now today. It is the one that I will do right now without worrying or beating myself up for what was done or not done in the yesterdays. THANK YOU ! When I am doing the Recipe for Recovery, ” I am recovery in each moment in my life as I open my heart, filled with gratitude, to the possibilities of each new day. I am recovery in all that I do.” Thanks Howard. Today, now in this moment, I will do my part. “Today, right now, is the next step towards my recovery. “ I now choose to make a different choice. I now choose to cure myself from Parkinson’s Disease!” I now choose to stop thinking and just Do the Recipe. If one can be cured of this disease, why is it not front page news? Where are the so-called cured people, where are they hiding? I know that Parkinson’s is curable by utilizing the Parkinson’s Recipe for Recovery®. I cannot explain why it is not front page news. There are no so-called cured people. There are four actually cured people: me, Marie, Pratima, and Betty, and we are not hiding. 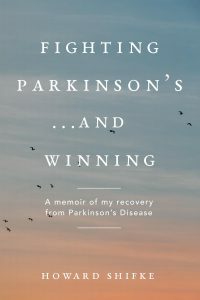 If you read this post, http://www.fightingparkinsonsdrugfree.com/2015/11/20/fighting-parkinsons-and-10-days-left-in-the-november-2013-challenge-2/, under the section “The Recipe’s Parkinson’s prognosis,” there are links to the posts of each of our recoveries. If you read the blog, you will see pictures of Marie, comments on the blog from Marie, Pratima, and Betty, and comments from many of the other people in this recovery community discussing how they are reversing their Parkinson’s. You have asked very good questions, and I appreciate the opportunity to provide answers to your questions. I was diagnosed in June I’ve been doing the recipe non stop since then it is apart of my day like breathing. I’m practical cured I just need to work out the final stuff. Parkinson’s is 100% curable. Don’t doubt the recipe just do it and let God do the rest! Thanks Brother! Hi Tony. The enthusiasm and positivity of your comments is infectious! Thank you – I’m very grateful.